For those of you who don’t know much about us – or are still under the impression I’m talking about the gay bar with which we share our name – please allow me to give you a brief history lesson. The Edge was originally founded in 1995, as an entertainment supplement to our sister publication, the Wessex Scene. 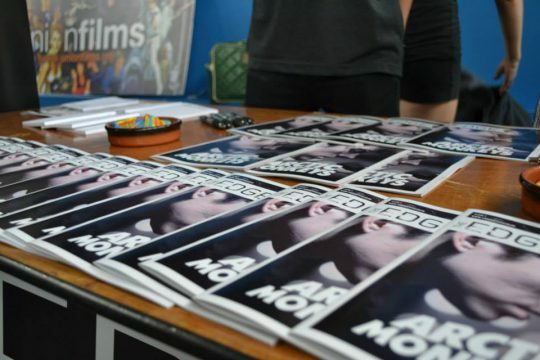 However, since 2011, The Edge has branched out on its own; becoming its own distinct media department within the Students’ Union and publishing print issues independently from the Scene. During our five years of independence, The Edge has continued to grow in leaps and bounds – we’ve won numerous awards, secured some truly monumental opportunities and even established ourselves among other high profile publications by getting one of our five-star reviews emblazoned on the nationwide cover of a DVD. Like our fellow media departments – Wessex Scene, Surge Radio and SUSUtv – we also pride ourselves on being an inclusive society; welcoming students of all kinds to write for us. Whether you’re a budding journalist looking for experience, an avid movie-goer, or simply someone with an opinion on the latest showbiz news, we’re always looking for new talent. From interviewing the stars to reviewing major shows, we have so much to offer our writers – and all you need to join is a passion for entertainment. Though many people I know play down their writing skills, we strive to give students of all levels and subjects the opportunity to get involved, take advantage of the opportunities available and have their voices heard. We don’t even require a regular quota from our writers – you can write whenever you feel like it, for as many or as few of our sections as you like. As we enter the academic year of 2016/17, my committee and I have already got stuck into each of our roles; all sharing the aim to make the writer experience even better. As well as running a number of great new features, we’re also concocting some really exciting plans for the upcoming year. From moving onto Year 2 of our award-winning Student Film Festival (in association with Wessex Films), to organising more fun socials and collaborations with our fellow media departments, The Edge looks set to have an amazing year – and you’d be crazy to miss it. If you’d like to join our band of merry Edgelings, add yourself to our main facebook group, or if you’d rather be an enthusiastic spectator, remember to check out our website for all the latest entertainment news and features!